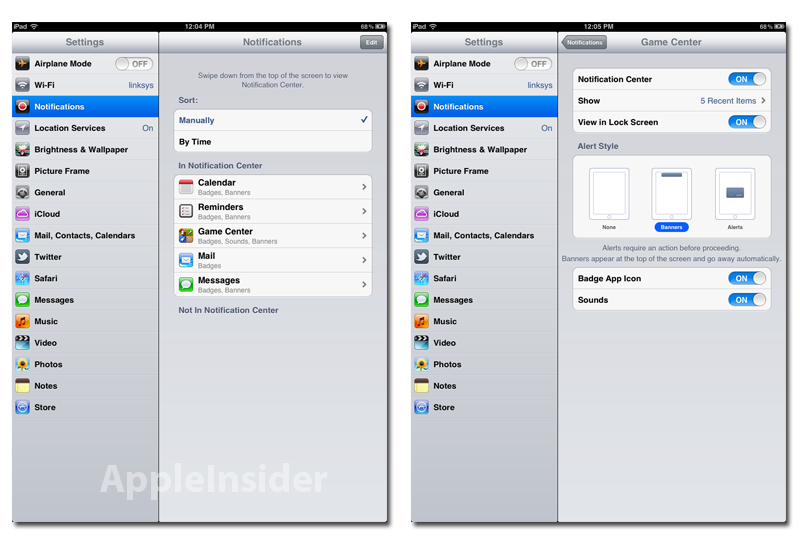 Apple has revamped notifications in iOS 5, adding a pull-down Notification Center, banner alerts at the top of the screen and more detailed lock screen notifications. Apple Vice President of iOS Software Scott Forstall acknowledged on Monday at the Worldwide Developers Conference that notifications in iOS 4 had several problems. In response to customer and developer requests for an improved notification UI, Apple has developed the Notification Center solution for iOS 5. 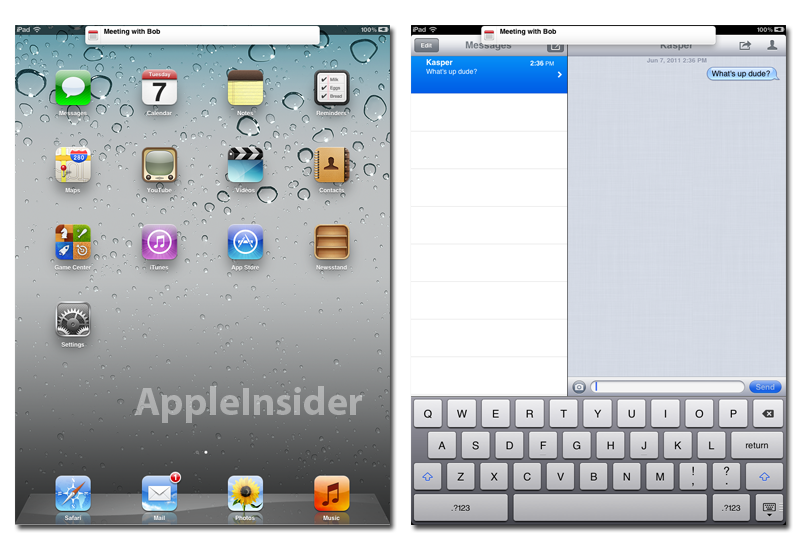 Forstall touted the new solution as going "far beyond" simply resolving customer complaints about notifications in iOS. Apple has also tied in its new Reminders app to work smoothly with the Notification Center, allowing for due dates and location-aware alerts. As before, notifications can be managed within the Settings pane of iOS. 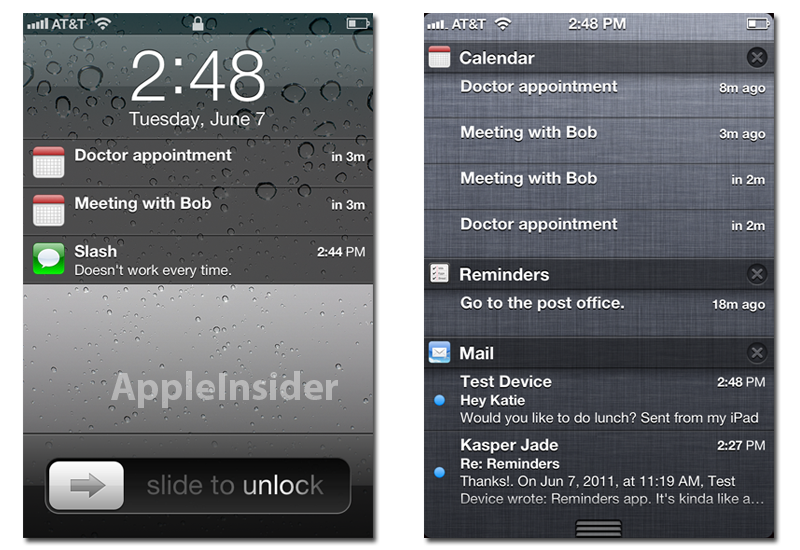 Users can choose whether applications can send notifications to the Notification Center and the lock screen. Apple also continues to offer the older alert notifications as a choice alongside the new banner notifications. Banner notifications are fairly straight forward. Tapping the banner will open the corresponding app directly to the related message or alert. The lock screen on iOS 5 now displays a list of recent notifications. Users can swipe a notification to be taken straight to the app from the lock screen. Swiping down from the top of the screen opens the Notification Center, which sorts notifications by app. Apple has built a location-aware weather display and a stock ticker into Notification Center. 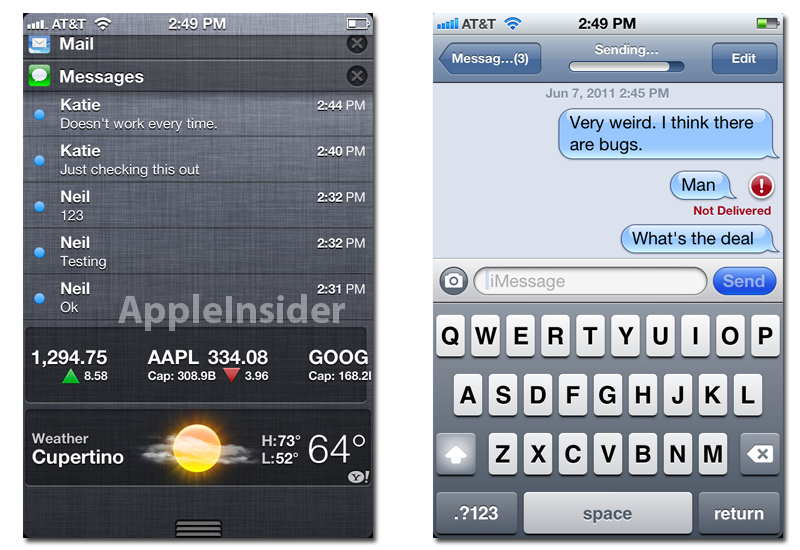 The new iMessage feature, which allows unlimited messaging between iOS 5 devices, also makes ample use of notifications, though the feature appears to still be in development. iOS 5 sports 200 new user features and 1500 new developer APIs. In addition to Notification Center, notable features include PC Free setup; updated mobile Safari with private browsing and tabs on the iPad and integration with iCloud for wireless syncing. The update wil be compatible with the iPhone 4, iPhone 3GS, iPad 2, iPad, iPod touch (fourth generation) and iPod touch (third generation) this fall, though some features may not be available on all products.